Well, there’s always something to complain about when it’s about movies. But I’m sure not every movie can comply with these rules : a strong story, convincingly played roles, not too predictable, not too corny, certainly not a melodramatic lovestory, the CGI must be stunning, the SE’s must be mindblowing and preferably catchy witty humor. Project these rules onto every single movie and you most probably can put aside most of them. Plus, it’s no fun to watch mind-bending films all the time. You’ll get a headache. And to be honest, the world is ruled by hypes. If we didn’t have that, we’d still be outside kicking a ball around or fill in a crossword. Having said this, I thought it was a nice movie. At least it’s better than “The Last Keepers“. 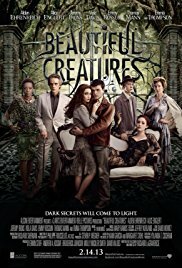 This movie is just like “Harry Potter“, “The Twilight Saga“, “The Lord of the Rings” and “The Hunger Games” a film adaptation of a successful teenage book. And of course the result is a heated discussion between supporters and opponents. A discussion wether the movie is similar to the book or not. It’s a syrupy fantasy love story. But at least I could keep my eyes open and I didn’t need a Dafalgan. You don’t need to think hard while watching this film. So, no headache afterwards.